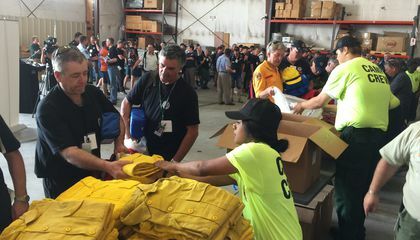 The mountainous conditions in the Pacific Northwest will be nothing new to the dozens of firefighters from Australia and New Zealand who have arrived to help battle the many blazes burning unchecked in the region. "We're used to tall timber and steep territory," said Warren Heslip. He is a 47-year-old firefighter from Southland, New Zealand. Heslip was among the 71 firefighters from the southern region who picked up equipment at the National Interagency Fire Center in Boise, Idaho. Then they headed out to help a ground campaign led by firefighters from across the West and supplemented by U.S. soldiers. The flames that claimed the lives of three firefighters in Washington, injured four others and burned 200 homes also inspired an outpouring of volunteers. They were invited for the first time in Washington state history to help battle the blazes. This summer's fire response across the West has been overwhelmed by destructive blazes. The fires have torn through the tinder-dry region. The biggest fire as of Aug. 24 was in Washington's Okanogan County on the Canadian border. A group of five fires raging out of control became the largest in state history. The fires burned more than 400 square miles, spokesman Rick Isaacson said. Lightning-sparked fires broke the state record, surpassing blazes that destroyed more than 300 homes in the same county last year. "I'd like to set some different records," Okanogan County Sheriff Frank Rogers said. The U.S. is in the midst of one of its worst fire seasons on record. Some 11,600 square miles have been burned so far. It's only the sixth-worst going back to 1960, but it's the most acreage burned by this date in a decade. So the ranking is sure to rise. So many fires are burning in Washington that managers are taking extreme measures. They summoned help from abroad and 200 U.S. troops from a base in Tacoma were the first such use of active-duty soldiers in nine years. Jim Whittington, a Bureau of Land Management spokesman in Portland, Oregon, said military assets cannot be used against wildfires until all civilian resources are deployed. 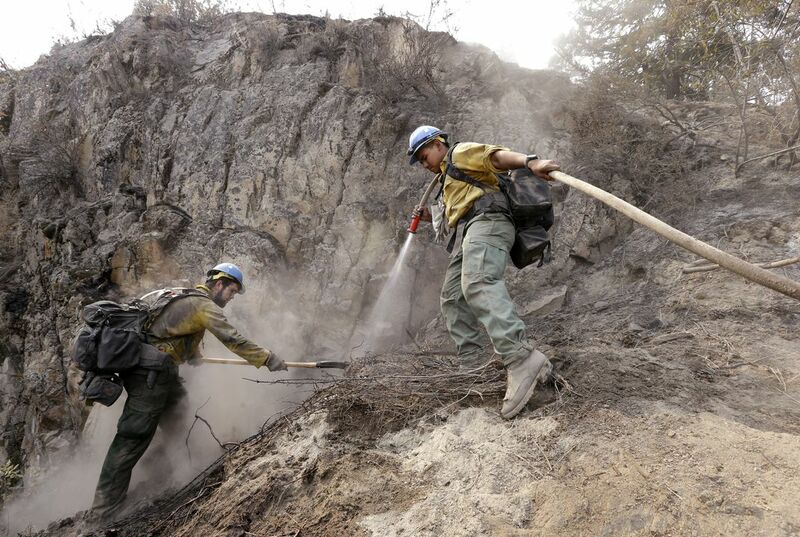 Since 1987, active duty military personnel have been mobilized to serve as wild land firefighters a total of 35 times. The last time was in 2006. Since then, it has not been necessary to ask for military assistance, Forest Service officials said. Nearly 4,000 volunteers also answered the state's call for help. It was far more than will be accepted, said state Department of Natural Resources spokesman Joe Smillie. The state is looking for former firefighters or heavy equipment operators. The hope is that they can bulldoze fire lines to corral the blazes. That would keep them from spreading in mountainous, timber-covered areas. So far, about 200 people with the right experience have been cleared to work. The dozens of firefighters from Australia and New Zealand were being outfitted to fill a critical shortage of mid-level fire managers such as equipment bosses, strike team leaders and supervisors. The Southern Hemisphere nations have been partners with the U.S. for more than 50 years. Australia and New Zealand are able to lend firefighters because the severest parts of their fire seasons occur at opposite times of the year. The last time the U.S. asked for their help was 2008. Fifty firefighters arrived. The U.S. sent firefighters abroad in 2007. Costs for the international firefighters will be paid by the agency they're assigned to, officials said, though no estimate was yet available. Chris Arnol, international liaison for Australia and New Zealand firefighters, said in Boise that the firefighters were ready to assist. "We understand how tough it is for you guys and we're happy to help," he said. Simon Martin, 40, a firefighter from Collie, Australia, agreed. "I'm sure there are a lot of fatigued firefighters out there," he said. Why are firefighters coming from as far as New Zealand to fight these fires? Because this is almost the largest fire in state history. Also, it is getting way too close to the Washington-Canadian border. Firefighters all the way from New Zealand and Australia are coming to fight the fires in Washington because they want to help us. They are used to the terrain making them the best choice of people to call in for the job. These firefighters are like stones, dropping into the lake and causing a ripple of kindness that will spread to all. They understand how tough it is and are kind people who are ready and happy to help.???? That was a very interesting article. I think it is great that all these men are helping out. New Zealands' fire season is on the opposite time of year. Firefighters are coming from as far as New Zealand because there are thousands of fires burning and the firefighters already there cant control them. Firefighters are coming from as far as New Zealand to fight these fires because there is a need for them due to the shortage of mid-level firefighters here and they just want to do some good and help us. Also, those firefighters have experience battling fires on similar terrains that these big and high quantity fires are in. Scary that there is so many fires; though all the same fascinating to see the work ethic to prevent them. I think it is neat to see different countries coming together to help one another!